Lamar Odom's infamous rap video was the last straw for Khloe Kardashian in terms of their marriage. The pictures tell the story ... on Nov 23, Khloe was in Australia, boarding a plane for the U.S. She was wearing her wedding ring. Khloe didn't know it, but TMZ had just posted a video of Lamar Odom, in which her hubby is clearly under the influence of something, rapping about infidelity -- "And when Khloe's out of town I still be on the DL." Sources connected to Khloe say she found out about the video on the plane and went ballistic. When she landed she was hiding her left hand in her purse. Two days later, the ring was gone and she hasn't worn it since. 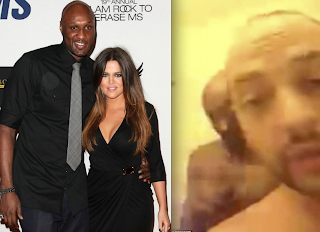 As we previously reported, Khloe WILL divorce Lamar. The question is when ... as far as we know, she hasn't decided when to pull the trigger. actually, PMK was the one "done with Lamar" and decided to send him out with a bang, with help from her connects in the media, like TMZ, for instance. I'm surprised Kris hasn't already had Lamar bumped off so that Khloe can go on her "poor, cheated-on, grieving widow" tour.